Representative for United Nations Department for Pubic Information. Global Youth Advocate with Policy and Strategy Group World We Want Campaign under United Nations. Working on: Sustainable Development Goal 17 Partnership building to achieve all Goals, Specifically focus on Knowledge sharing platform On Social Innovations and easy adapting technologies, Working on Reforming Policies to Protect Rivers in India for Save Rivers India Working as a Advisor to Create Knowledge Sharing Platform for Maldives Association for Disabilities, Maldives. Fund Raising Campaign for United Nations Associations. Negotiating with the International Development Agencies. Collaborating with Corporates to get the support on Food and Water Resources. Designing Fund Raising Campaigns both Online and Offline Introducing New Technologies for Sustainable Development for the Country Helping Governments to Adapt and Reform Policies to Achieve Sustainable Development Goals. Working with State Government of Maharashtra to Adapt Road Safety Policies by United Nations in Government Policies to Achieve Target on Road Accidents Collaborating with Universities and Colleges to Educate and Create Awareness of Road Safety Designing Annual Campaign on Road Safety. Shortlisting Schools in Nepal destroyed after the earthquake Fundraising for School Development Documentation and Permission Multilateral Partnership Building. Speaker at Women’s Economic Forum Road Safety Workshop for Motor Vehicle Department of Maharashtra. Attended as a Content Specialist Participant at Asia Pacific Ministerial Conference for Disaster Risk Reduction Organized by Government of India. Resource and Content Specialist at Road to Right Conference at Colombo Speaker at International Conference Education as a Driver to Achieve Sustainable Development Goals. Resource Specialist for Global Water Meet 2016 Dharwad, India Resource Specialist for Road to Right Conference for Human Rights Peace Expo 2016 Colombo, Sri Lanka. 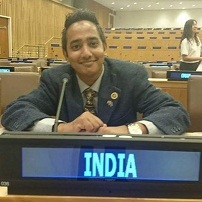 United Nations General Assembly 2016 Advocated as a Youth Observer. Asia Ambassador for IYONS NGO Summit held in Chennai, India. St Anne’s College Bangalore, India. Committee member for Annual DPI Conference 2014 NY, USA. Honoured with Cultural Book of India 2017 for International Relations Humanity Service Award 2017 by Crime Control Force, India Youth Iconic Award 2017 by Women’s Economic Forum Community Service Award 2016 by Indo- American Society. All India Human Rights Award Dhule City, Maharashtra, India. ROAD SAFETY AWARD 2015 by State Government of Transport Department Maharashtra, Regional Transport Office, Mumbai. Best Article Presenter in REACH 2015, Conference Organised by ST. Anne’s College, Bangalore, India. Human Rights Activist Award 2015 by ALL INDIA HUMAN RIGHTS ORGANIZATION, Delhi, India Research Excellence Award for 2013 by Indus Foundation USA & Andhra Pradesh Govt. India.